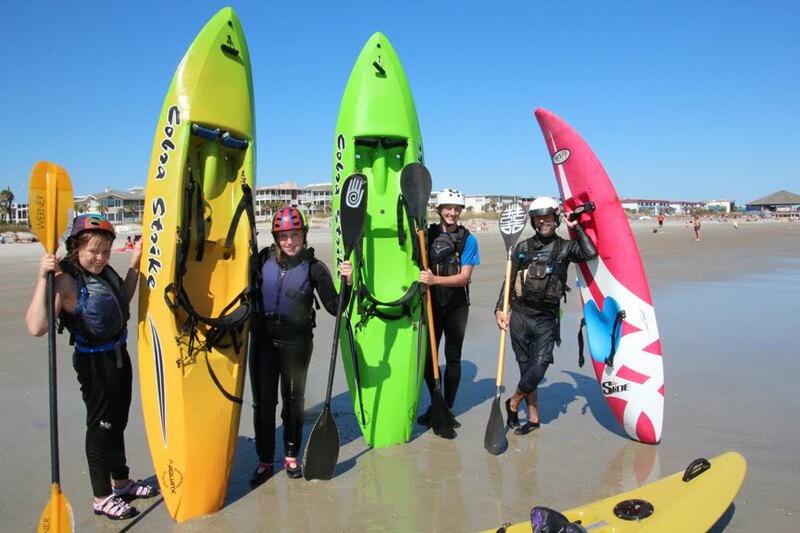 On the calendar this week, in addition to the usual sea kayak tours and classes, we've got surf kayaking levels 1 & 2 on Saturday and Sunday. We met at the south end of Tybee beach and staked out a spot on the sand. 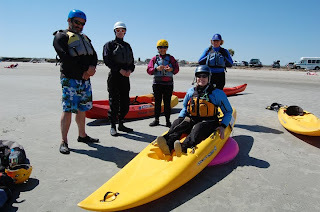 Our class figured out pretty quickly over introductions that we ranged in ability from seasoned tour guide to flat water rolling junkie to total paddling novice - no matter because we were all surf kayak newbies. 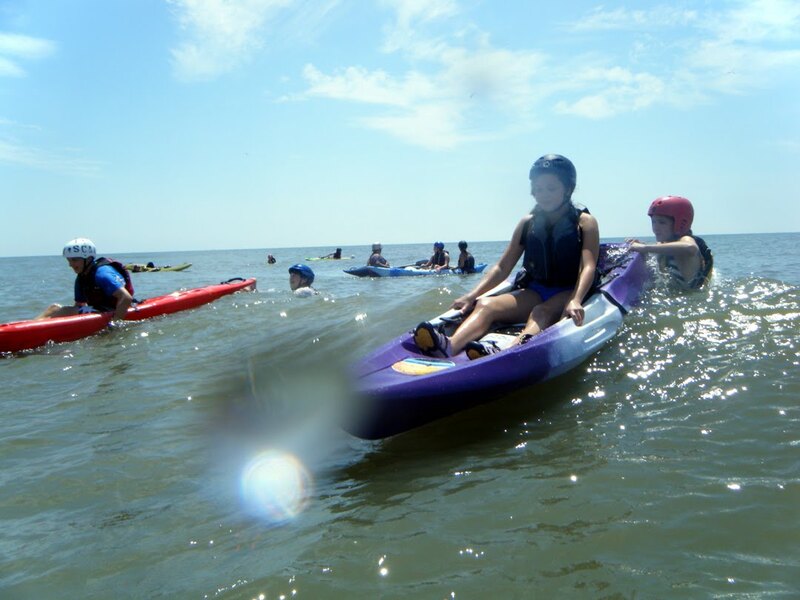 The agenda was set out for the class - be safe, learn how to catch a wave, and enjoy the ride! After selecting helmets, strapping on our pfds, and adjusting the thigh straps of our sit on top shredders, we plunged into the waves for some drills. Diving - what you do if you're standing in the water and a kayak is speeding towards you. Handstands - good for holding your breath under water. Capsizing and releasing from the thigh straps - a.k.a. the sit on top wet exit. Holding on to the boat in the waves - very important so you're not the guy whose kayak levels the kid bobbing in the water by the shore. Getting back on the kayak after falling off - pretty key as we will all fall off a lot on our first waves. 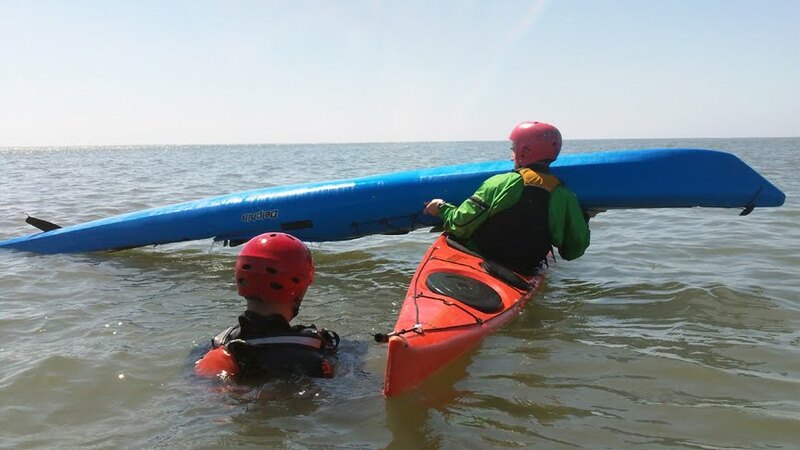 Next, we partnered up - one person stood waist deep, holding his partner's kayak in position and gave him a little push to catch a wave. This was followed by a joyful whoop during the ride, then a clumsy capsize and mad grab to hold on to the boat. Balance was crucial, and we put those early drills to use. We took a break on the beach for a lesson on basic strokes, waves, and surf lingo like "soup," "outside," "riding the daybed," or "surfing the attic door." Soon after we grabbed paddles and boats and headed back out. 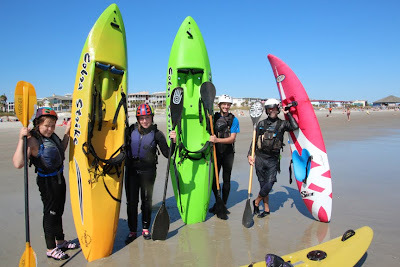 The short paddle shafts and fat blades felt different, but gave us more oomph to paddle over the breaking waves to the outside. We made it, and the shredding began! Lots of adrenaline, lots of cheering, and lots of perfect waves just missed. After a good ride or a near miss, we all agreed - we wanted to paddle back out to try again. Some of us ended the day just catching rides and hanging on, others were already learning to carve. Carve, you say? More about that in level 2. It was hard work paddling - but well worth the effort when you let the wave take over. At the end of the lesson we gulped down water as our instructor recapped the basic safety lessons and surfing principles again. Finally, we left the beach to refuel on the deck at Hucapoos and relive our best rides. So, still don't think shredding waves on the frontside is for you? 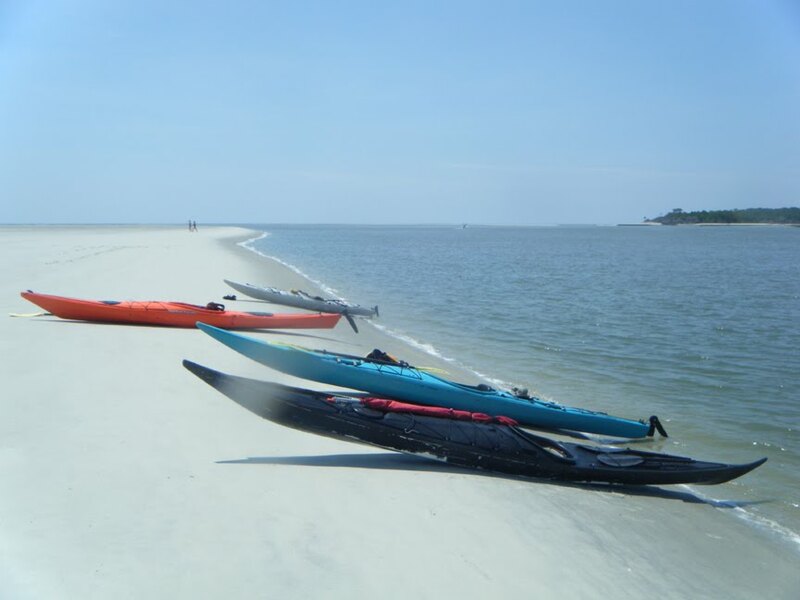 That's ok, the tide is perfect this weekend for tours through the less traveled Little Tybee cuts. Join us for a full day in the marsh on Friday, or through "Mosquito Run" on Saturday. 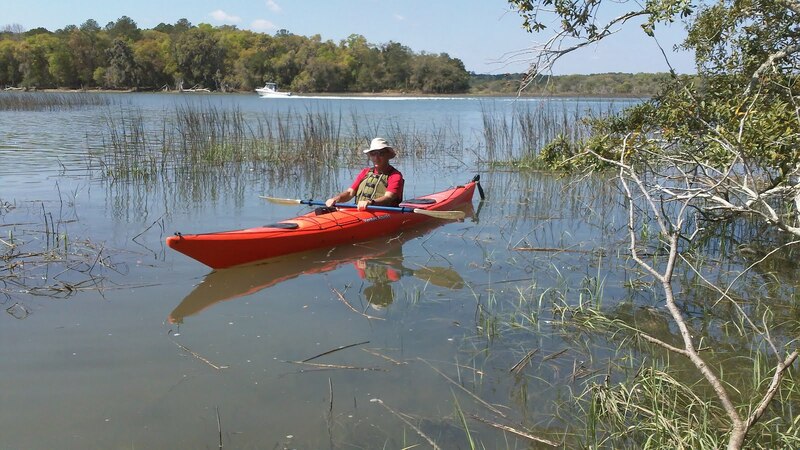 Whatever your speed, we hope to see you on the water! East Coast Kayak Festival in Good Shape. Charleston's East Coast Canoe and Kayak Festival continued to ride the spilling wave of optimism washing over the land. From Bonaventure to Canoecopia, it's been a promising start to this election-year paddle season, as people have decided that life, and paddling, must continue regardless of regime change and economic melancholia. This was our first year not in attendance as either instructors or vendors at ECCKF. 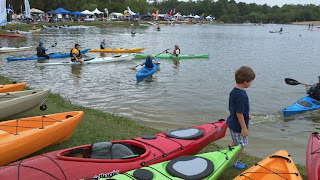 We did pay a quick visit on Saturday just to say hi to friends, paddlers, and countrymen, old and new. We were greeted by a healthy dose of activity both on and off the pond. Class attendance on the lake looked great, as was the attendance of the paddlesports manufacturers around it. The SUP trend continued it's mighty conquest, with lots of loud splashes as the SUP groms bit the dust time and again. Even Dubside cruised past in commando stance (didn't know he could stand), as somebody shouted out "roll that -ucker". The P&H crew were cooking up a storm, as always, with the ever popular Cetus and Delphin ranges. The Tiderace booth was also swamped with test paddlers eager to experience the newest Tiderace Extra... looking super hot in it's NASCAR paint job. The Hobie Fishing team were also frying hard, and won top marks for UV protection attire and branding. The pedal revolution continues to turn. Epic Kayaks were blowing out some nice looking blades...not as cheap as last year, but still some good deals to be had. Commander Josh kept it all in order, as he buzzed about the park on his new Segway and high vis helmet. And surf kayaks, you ask ?....well, not a single one to be seen anywhere. Imagine that!. If you live in the south, this product makes a lot of sense. We love the sun, but it doesn’t always love us back, and the backs of the paddlers hands really take a beating. 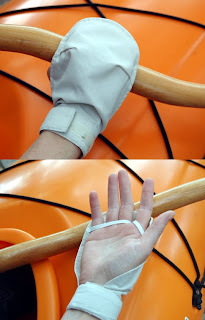 In the past we've tried wearing extra long shirt sleeves, old socks with thumb holes cut out, and we have even wrapped our hands with grapefruit rinds. So, we were very interested when we saw this product from those great folks at Kokatat watersports wear. These lightweight hand covers are great for summer paddling, when sunscreen washes off quickly and gloves interfere with gripping the paddle comfortably. For touring and casual paddling these hand covers offer the highest level of sun protection on a high UV intensity body part. We love Exped camping gear. It's well thought out, designed and constructed. Anyway, The Cargo Bag... A multifunctional, padded splash bag, will keep your packed lunch from getting crushed, or protect your binoculars from getting scratched. The water resistant zipper opens the bag up with a wide mouth for easy access to its contents, and a shoulder strap comes in handy when you get out of the kayak to roam the beach. It comes in three sizes. The smallest one holds an SLR camera with a standard lens. The middle size (pictured) will hold binoculars or spotting scope and small camera, and the largest size will take it all. Great for kayak and canoe. To check out these and many more paddler specific products, swing by the shop. We are on the way to the cemetery ! Recovering from Spring Break frenzy? A relaxing paddle is just the thing. Planning your next adventure? Brush up on your rescues or learn about risk management to better prepare for your trip. 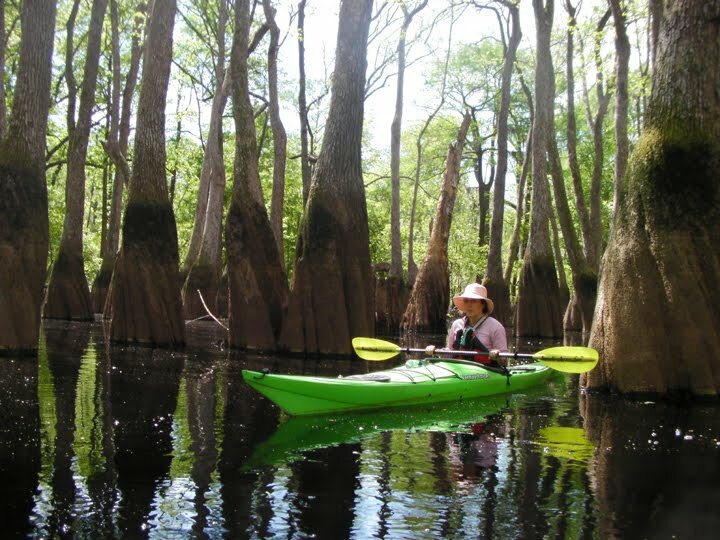 Mon 16 Apr: Full Day Trip Ebenezer 10:00 – 2:00 Escape the midday sun under the shade of the cypress trees. The leisurely pace of the creek affords ample time to take in the scenery and keep a keen eye out for birds. It never gets old embarking on the short paddle across the Back River to uninhabited Little Tybee. How lucky to be able to get away from it all while still being so close to home. Thurs 19 Apr: Risk Management Seminar at the shop 6:00 – 8:00 Even with careful preparation for a paddle or trip, we need to be ready when things don’t go as planned on the water. 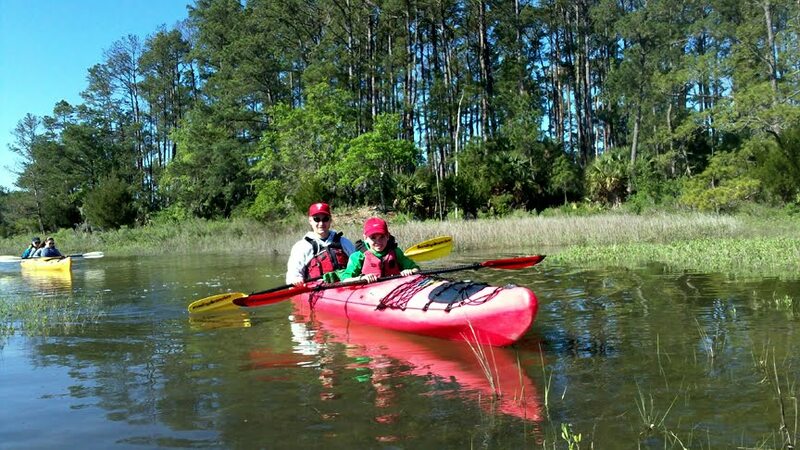 Learn how to evaluate risks and manage your paddles so you can be safe and have fun! Fri 20 Apr: Half Day Tour Cockspur Lighthouse 1:00 – 4:00 Dolphins are a common sight on this trip paddling out Lazaretto Creek past the Tybee shrimp fleet into the Savannah River estuary. Stretch your legs getting a closer look at the abandoned lighthouse. 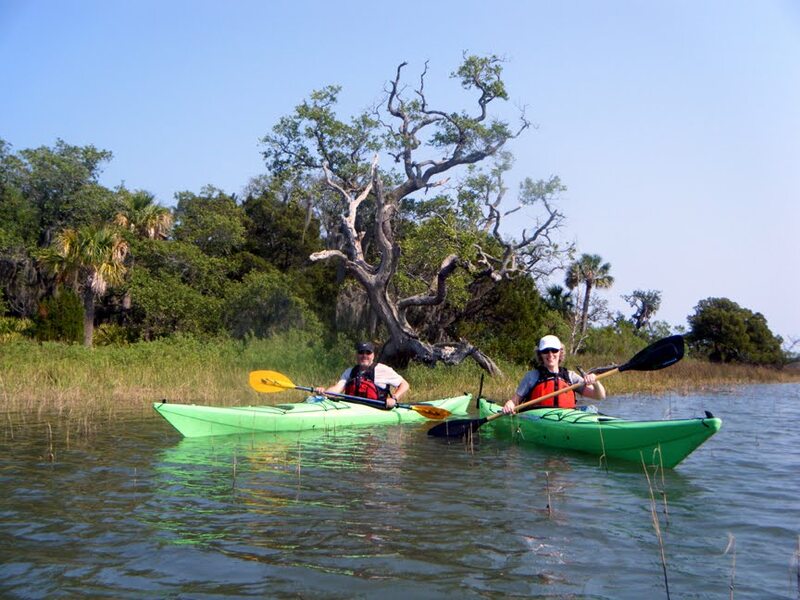 Sat 21 Apr: Half Day Tour Little Tybee 8:00 – 11:00 It’s beautiful to be among the first on the water in the morning! The Spring air is warm and the water refreshing. Time to practice getting in and out of your boat, and we don’t mean from the beach! Spring has sprung on the ever beautiful, other worldly Ebenezer Creek. A great trip for those wanting to see a quiet, historic side of Savannah, plus you don’t have to fight the traffic to Tybee. And lets not forget our mother...earth that is. Saturday is Earth Day. 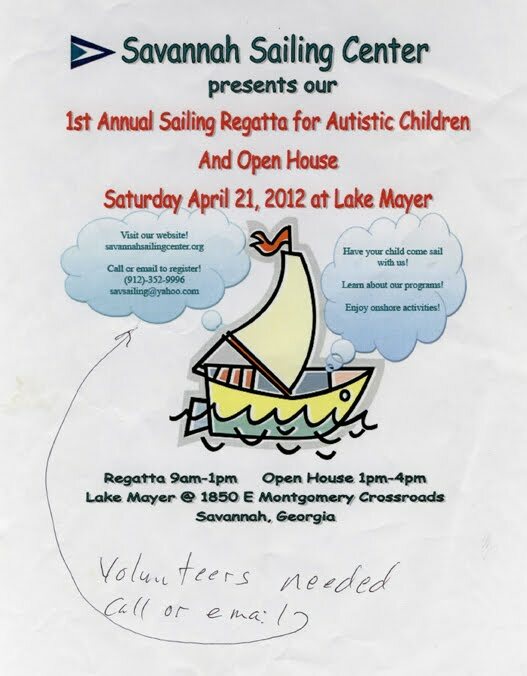 Give her some love, and maybe swing by Lake Mayer for the 'Kids with Autism Sailing Regattta'. 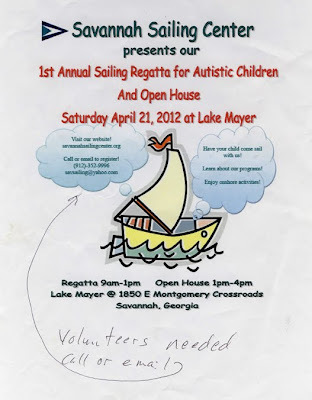 Give em a hand, or just go see what the sailing center is all about. That was a busy week! We are a small company offering small group activities, and we are in high demand. We recommend to all our customers that they book well in advance, and think about planning the vacation around the kayaking. That's what we do when we go away, and it often makes for a much more interesting vacation all around. The success of any paddling trip is in the planning. You will get a much better quality trip if you book at least several days ahead. 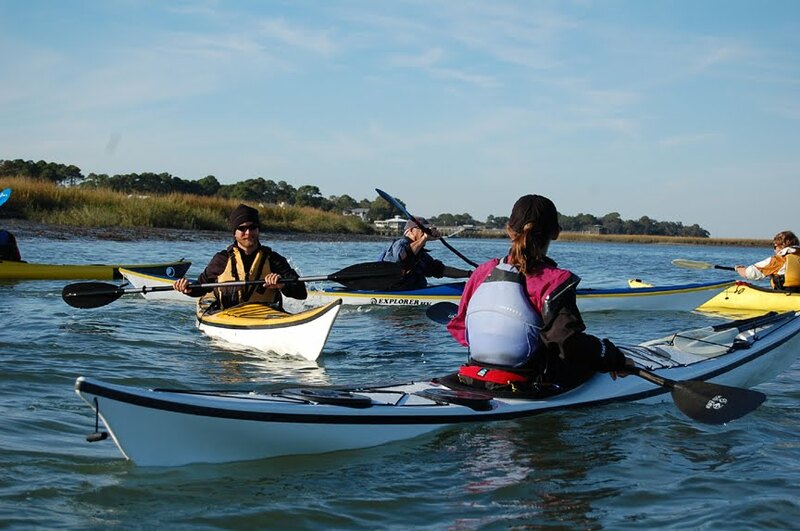 If you have to 'go kayak now', we recommend calling Sea Kayak Georgia or North Island Kayak, who are much better set up to handle 'walk ups'. So, the rest of the week looks like a good one for weather and trips. Plenty going on for all interests and levels. This is one of our favourite day trips for any skill level, and particularly makes a great outting for a family. Lots of marsh creek paddling. Bring a picnic lunch for some quiet time with the shore birds. Paddling Narrows is a trip into the past, with great history and natural beauty. 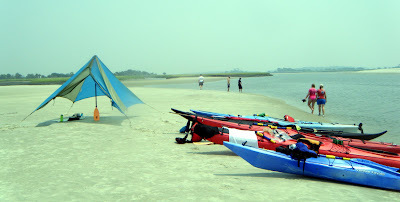 Highly recommended for half and full days..
More paddling through more of Little Tybee. Mosquito Ditch is a right of passage. Trip to the old fort. Not much going on here, as usual.....ssshh, this ones a secret.